Welcome to LaSalle Auto Centre, where we have been providing outstanding automotive service and value to the Sarnia Lambton since 1980. Please take the time to browse our site and familiarize yourself with our complete automotive parts and services and our staff . Make sure to take a moment to check out our News & Info section and sign up for our monthly newsletter where you will receive promotional discounts and tips and tricks to keep your car running smoothly. 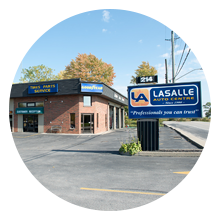 We believe at LaSalle Auto Centre that through effective communication and proper diagnosis, our staff and technicians can effectively service your vehicle and exceed your expectations. Our commitment to efficient, honest and professional service has been the key to our success. We believe we have the best technicians and the highest quality parts you can find so we back up our works with our warranties. Please do not hesitate to contact us about any vehicle repair concerns.